Oversized windows throughout this two-storey home bathe the rooms in an abundance of natural light. 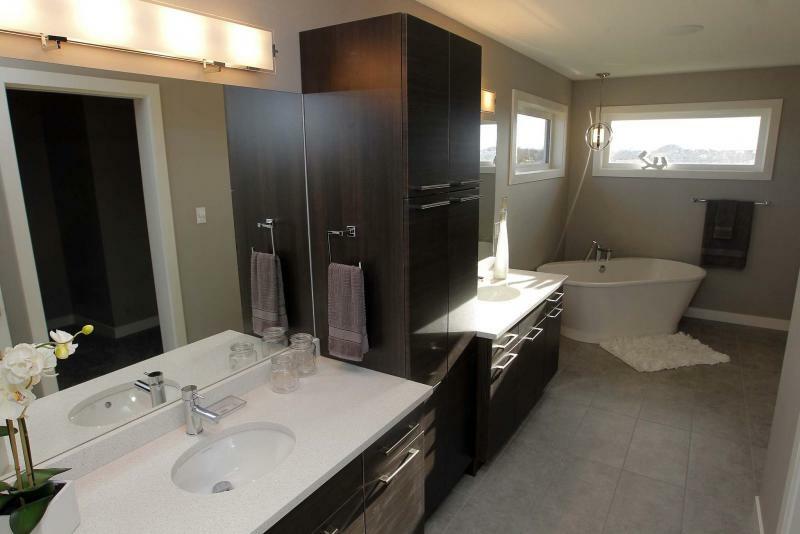 The spacious, and spa-like, master ensuite has a stand-alone soaker tub and dual sinks separated by a storage tower. If there’s one thing a big family needs in a home, it’s space. Glen MacAngus, Paradigm Custom Homes’ sales representative for 6 Prairie Grass Lane in Oak Bluff West, says the the 2,516 sq. 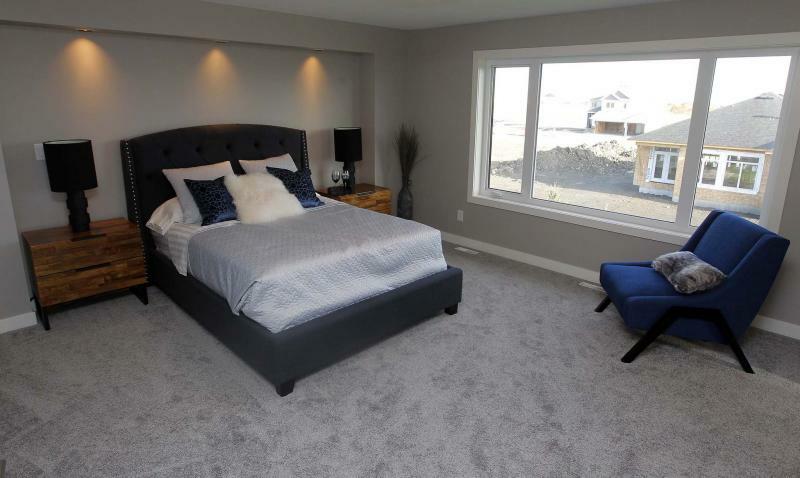 ft., two-storey home offers that — and more. "It’s a spacious, contemporary design that offers all kinds of space at every turn," he says, noting it was built on a 72-foot-wide lot. "That width allowed for a 50-foot-wide home that features generous spaces and a well-organized layout. It’s perfect for a large, active family." Because today’s modern family is so busy — constantly coming and going from school, work and various activities — a home’s access points (i.e., foyer, mudroom) must be exceedingly user-friendly. Paradigm’s design team hit a home run with both spaces, MacAngus says. "First of all, the foyer is huge, featuring an eight-foot wide entrance that gets even wider as you move forward into the home. A wing to the right holds a gorgeous powder room and doorway that links it to a cool mudroom." Cool in a functional sense, that is. Like the foyer, it’s wide and deep, providing plenty of room to off-load shoes, coats and other odds and ends. "Families will love the kiddie-cubbie storage locker on the side wall, which offers benches with storage for shoes underneath, an area to hang coats and two levels of shelving above," he says. "It’s a great feature that helps to keep everything at least relatively organized as families come and go. Then, there’s a doorway off the mudroom that leads to another space." That space is none-other than a supremely spacious walk-through pantry. "Everyone who’s been through the home has absolutely loved it," adds MacAngus’ sales associate at Royal LePage Top Producers, Marlene Klump. "It comes with storage racks that add all kinds of storage space, and allows you to bring groceries directly into the kitchen from the (attached triple) garage. There’s also a pocket door on its side entrance that allows you to close it off from the foyer." A doorway at the front of the pantry then takes you into an island kitchen that comprises one-third of an open-concept great room area that can serve as the home’s hub during the day — and then transition seamlessly into an alluring entertainment centre at night. 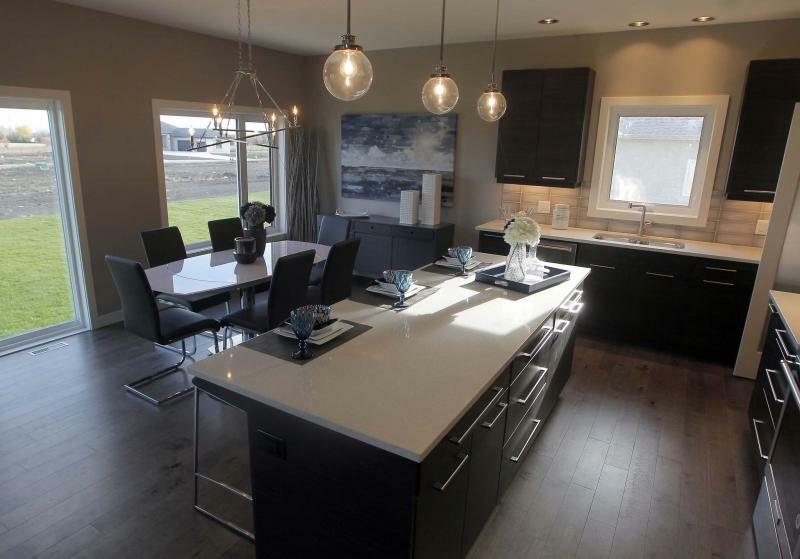 "All three spaces (kitchen, dining area, family room) are well-proportioned," MacAngus says. "The kitchen features an eight-foot-long island that offers lots of prep space, and seating for three. The dining area is just steps away, and can hold a table for six to 12. If you really like to entertain, you can use the flex room off the foyer as a formal dining room to accommodate more guests." In addition to its functionality, the great room — which features nine-foot ceilings — is exceptionally comfortable. "I think a few design elements work together to create that relaxing feel," MacAngus says. "The rear wall is filled with glass; that makes for a naturally bright area. At the same time, the finishes give it a warm feel. The five-inch (Mirage Image Rock Cliff Old Maple) hardwoods are front and centre there. Their texture and bronzy, cinnamon colour is really soothing, and welcoming." At the same time, the other finishes — espresso (Chillagoe) thermofoil cabinets, cream/grey/taupe Caesar Stone countertops and a smoky brown (Ceratec) glass tile backsplash — meld effortlessly to do their part in creating a warm, tranquil environment. "I also love the entertainment unit in the family room," Klump says. 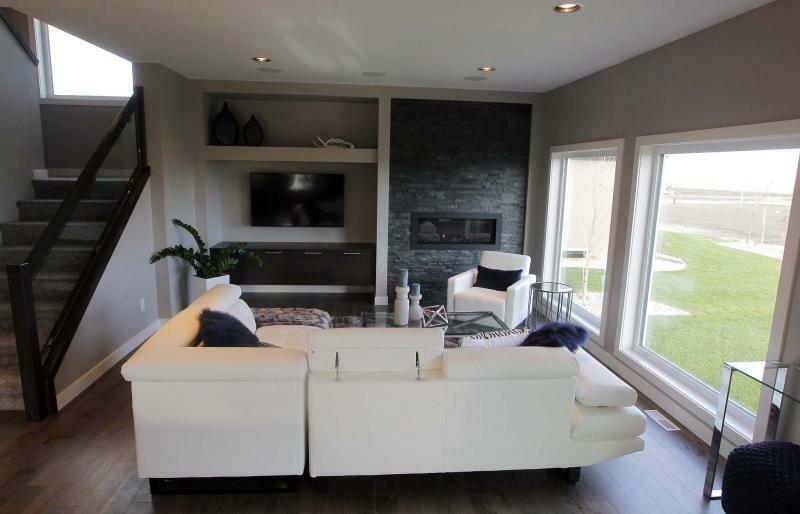 "The gas fireplace, with its charcoal feature wall, is elegant, and the TV niche and shelving next to it is efficient, yet stylish." The same could be said for the home’s upper level, which contains four bedrooms, a main bath and laundry room. Its high livability quotient is derived from its intelligent floor plan, MacAngus says. "The layout is a reverse L-shape, which is incredibly efficient. The master suite was placed to the left of the stairs next to a huge laundry room, while a wing set on the other side of the landing contains three big bedrooms (with oversized windows and huge closets) and a beautiful main bath." Set off in its own isolated spot, the master suite is a space that was designed to rejuvenate, he adds. "Tons of relaxing natural light floods in through a huge picture window, while the cantilevered side wall provides a setback for the bed that opens up space. Then there’s the ensuite. With its stand-alone soaker tub, dual sinks (separated by a smart-looking storage tower), five-foot shower, (taupe) vinyl tile floor and integrated walk-in closet, it’s a spa-like space." Finish the basement (which would add over 500 sq. ft. of living space) and you have a spacious, well-appointed home on a huge lot that comes in at under $700,000. "This is a great design, as is our spec home at 15 Country Vista Drive in La Salle (priced at $529,900). Paradigm will also have a new show home at 43 Woodbridge Drive in Bridgman Estates in La Salle in the spring," MacAngus says. 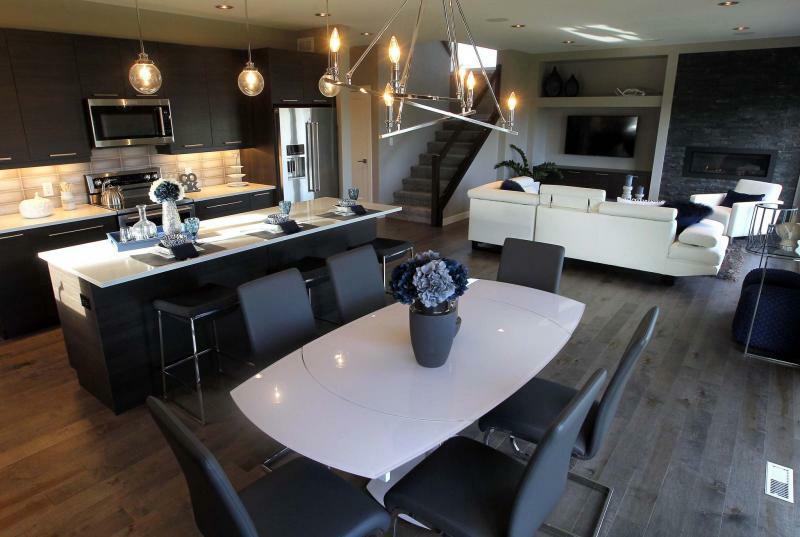 "Every home Paradigm Custom Homes builds is built to the highest specifications, and is designed to be as functional as it is stylish."